Disaster - probably my mistake, but still disappointing. First, the batter was very stiff after folding in the flour by hand, I thought there was some liquid missing. The recipe instructs you to bake the cake for 70 to 80 minutes, I checked after 50 minutes for the first time. The edges were already pulling away from pan and looked very dry. I used a skewer to check for doneness in the middle close to the tube and it came out clean, so I took the cake out of the oven. After letting it cool, I realized that the middle was still underbaked and inedible. Using the outer parts of the cake I cut it into squares and threw out the rest. Tasted nice, but nothing special. Had I let it stay in the oven longer, the edges would have probably been inedibly dry and the center would have been ok. Either way the cake still would have been a failure. There are many other, much better apple cakes out there. A charming book filled with recipes that reflect a by-gone era for the modern baker. Baking is as much about feeding someone's heart and soul as it is about nourishing their body. It's also about kindness and generosity: whether it's a pie or a tray of cookies, baking is always meant to be shared. 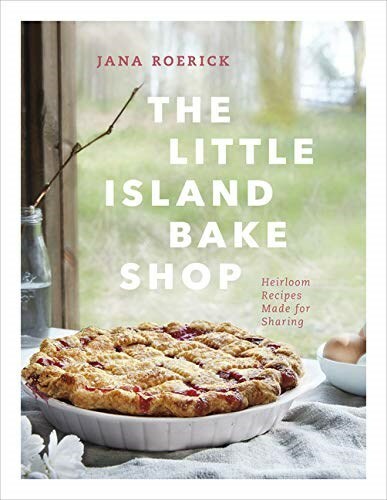 The Little Island Bake Shop by Jana Roerick features a collection of 80 easy recipes designed to satisfy almost any craving. Freshly baked muffins are a perfect start to the morning, while grab-and-go cookies make delectable treats throughout the day. Looking to make celebratory occasions even more special? Jana's signature pies and cakes are as simple to make as they are delicious. The cookbook also includes a savoury dishes designed to nourish: comforting pot pies, satisfying quiches, lamb patties, and even homemade pickles. Lastly, a section devoted to the essentials--basic pastry doughs, frostings, glazes, crumbles, and custards--will have you mastering the basics in no time. The Little Island Bake Shop is a wonderful collection of everyday bakes designed for cooks of every skill level. From a Perfect Pound Cake to irresistible Chocolate Chip Cookies to a crowd-pleasing Sour Cherry Apricot Pie, this is simple comfort food at its best.